PicoQuant offers different solutions for time-resolved confocal microscopy. The available systems include single molecule sensitive microscopes with picosecond temporal resolution and super-resolution imaging capabilities as well as upgrade kits for laser scanning microscopes of all major manufacturers that enable time-resolved applications. The advances of cutting edge science in many fields depend on single molecule studies. This includes, for example, the quantification of molecular dynamics or molecular properties as well as interaction studies in material and life sciences. Such a wide field of research requires a flexible instrument, which can be adapted to the individual needs. This versatility is given in the MicroTime 200, a time-resolved confocal fluorescence microscope system. 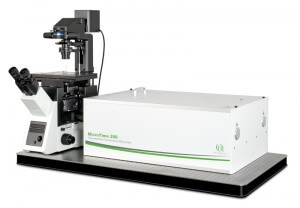 This powerful instrument is ready to analyze a multitude of parameters down to the single molecule level using methods such as Fluorescence Lifetime Imaging (FLIM), FLIM/FRET, deep tissue FLIM, PIE, FCS/FCCS,FLCS/FLCCS, dual-focus FCS, anisotropy, burst analysis, simultaneous AFM/FLIM or deep UV detection, to name only the most common. Even high resolution imaging with spatial resolutions below 50 nm is possible with the new MicroTime 200 STED add-on.